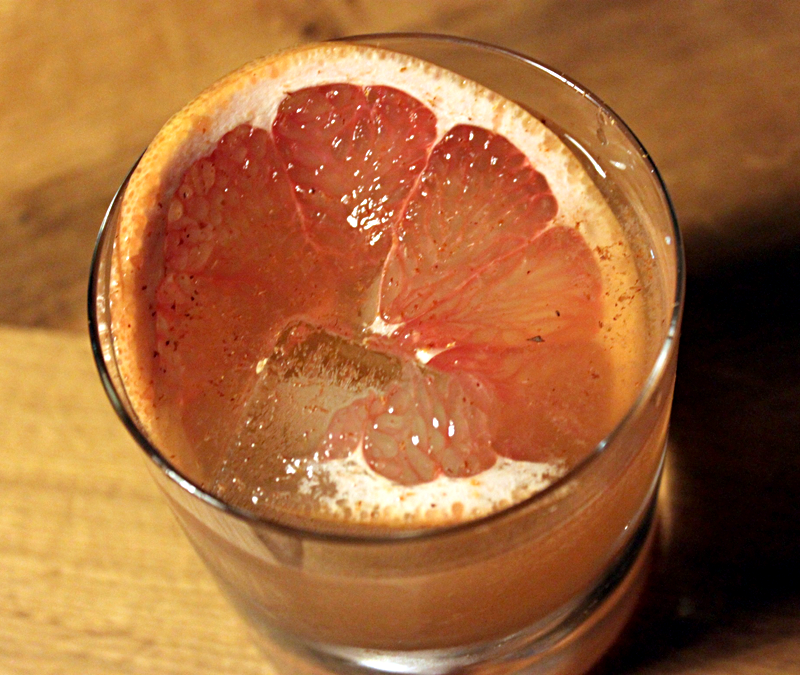 I had very fond memories of this rum, grapefruit, cinnamon drink, and in fact, I remembered it as one of my happiest accidents. So, the other day, I mixed one up and I found that the flavor was too sweet, perhaps even cloying. I have updated the drink, looking through the lens of more experience running this blog. The new version, which I have named, is a significant improvement. In the original, I used Monin vanilla syrup, and white grapefruit juice, and I derived the cinnamon flavor from cinnamon sticks. When I remade the drink, I used pink grapefruit juice, due to availability, and my homemade cinnamon+vanilla syrup, which I make a bit rich at 1.2 sugar/water. I think the Monin syrup is closer to 1.0, and that the juice of white grapefruit is undeniably dryer, and perhaps a bit more complex than that of the pink. It was not only the sweetness of the drink that did offend, it was also the texture, which I found to be slightly syrupy. The flavor, however, was balanced between cinnamon and grapefruit, so I did not want to adjust the quantity of syrup. Making a lighter syrup would be one option, but I preferred to lengthen the drink by pouring it over ice, and topping it with two ounces of champagne. The ice is perhaps unnecessary, but I wanted to serve it at a party as a highball, and it did not detract from the texture. If your syrup is not a bit rich, I would not use ice. Shake all but Champagne over ice and double strain over fresh ice. 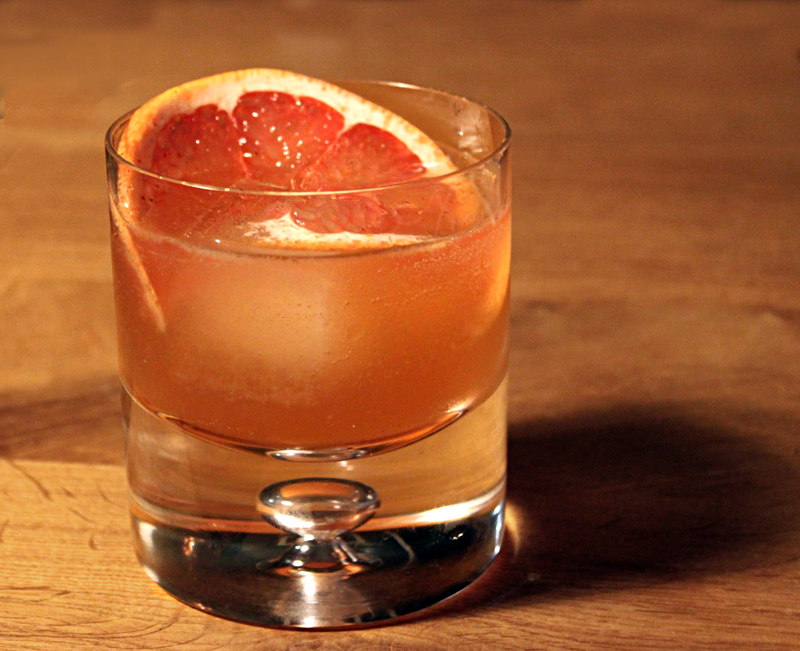 Top with 2 oz Champagne and garnish with a grapefruit slice. Grate a bit of fresh cinnamon on top of the grapefruit in front of your guest, for aroma. The flavors of this drink somehow came together in a way that suggested cherries and almonds, even though neither of those flavors was present in the ingredients. There might have been notes of those things in the champagne we used (which was from Trader Joe’s, I can’t remember the label), but certainly not enough to create those impressions as distinctly as they were present in the drink. I worry that my garnishing procedure grows too elaborate, sometimes. Part of my garnish-o-mania derives from the necessity to take interesting photographs, but it has become one of my favorite parts of the craft. This post is running long, but one quick note on the name. It had rum, and champagne, and I was serving it at a formal party, so I named it after a popular internet cat picture, which I much admire. This is one of my favorite original creations to date. Cheers! Categories: original creations | Tags: alcohol, bartending, booze, bubbles, bubbly, champagne, cinnamon, craft cocktails, dark rum, drinking, drinks, grapefruit, liquor, mixed drinks, mixology, rum, simple syrup, sparkling wine, syrup, vanilla | Permalink. You can NEVER have too much garnish! I can see how this would be great and, at four ingredients, good for volume flipping. 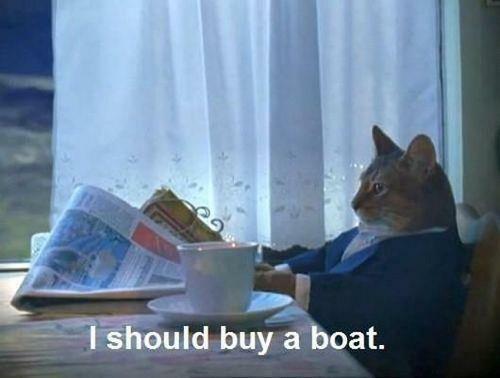 I want a boat! My spouse and I absolutely love your blog and find almost all of your post’s to be just what I’m looking for. Do you offer guest writers to write content for you personally? I wouldn’t mind writing a post or elaborating on most of the subjects you write with regards to here. Again, awesome site!